Bringing this festive bread recipe back to the front today! Try it as part of your St. Patrick's Day this year! Add the egg mixture into the dry ingredients and stir with a wooden spoon until you need to knead it with your hands. Shape into a round mound, place on a lightly floured piece of parchment paper on a baking sheet and lightly slice an "x" across the top. When slightly cooled, slice and enjoy. 2. Then add the following and stir until well combined. 3. Roll into small balls and place on parchment paper. 4. Refrigerate for 1-2 hours and then store in Tupperware in the fridge. Try this easy dish and it will become a staple in your weekly meal rotation. thighs, tenders, whatever you prefer) and mix until all of the chicken is coated with the dressing mixture. 3. Line a 13x9 baking dish with tin foil (for easy clean-up) and pour the chicken and dressing mix in the dish. Bake at 375 degrees for about 30 minutes or until the chicken is cooked all the way through. 4. Meanwhile, cook a package of whole-grain egg noodles according to the package directions. Add chopped broccoli right into the boiling water with the noodles for no more than 4-5 minutes. Drain. To serve, scoop the noodle-broccoli mixture onto a plate and top with the baked chicken and sauce. Enjoy. It's that easy. Thank you to my mom for this easy week-day meal! 1. Saute about 6 slices of bacon until crisp. Remove from pan and set aside for garnishing. 2. Cut about 1 and 1/2 lbs chicken into bite-sizes and toss lightly with flour, salt and pepper. 3. Saute the chicken with a large sliced onion and 3-4 garlic cloves in the bacon grease. 4. Add about 15 quartered dates (pit removed of course!) and in the same pan, add about a 1/3 of a bottle of fruity red wine. Let this cook down for about 5-6 minutes, then add the zest of one lemon. 5. Add one cup of chick stock and simmer for about 10 minutes. 6. Meanwhile, cook a package of gnocchi according to the package directions. After draining, saute the gnocchi in 2-3 Tablespoons of butter and season with nutmeg. 7. 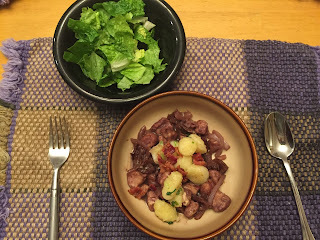 To serve, scoop the beautiful chicken mixture into a low bowl, top with gnocchi in the middle, and garnish with bacon crumbles and chopped scallions. Serve with a side salad and enjoy! This one is a surprisingly easy and delicious meal. It's become one of my standard go-tos in the menu rotation. Cover, bring to a boil, and let boil gently for about 10 minutes. 2. Turn the heat off and then stir in 1 can of rinsed and drained black beans and 1/4 cup shredded cheese. Let this amazing combination rest for about 5 minutes. Thank you to The Wholesome Dish for this incredible dish.